In my last blog post, I described an example with 6 people and asked you to consider how you would organize them. 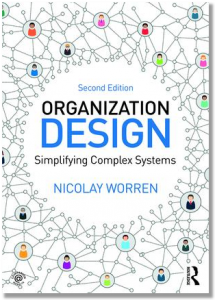 The example illustrates an analytical approach to organizing projects based on how people actually work (or more precisely, based on the work process interdependencies). In the video below I describe this approach. You may ask: Why do we need an “analytical” approach here, aren’t project managers able to do this perfectly well? Even with only 6 people, there are 6*5 = 30 potential interdependencies! Out of the 30 potential ones, we have 9 actual interdependencies in the example. Still, it’s more than than the human brain can process intuitively. At least my brain. So it is better to use a tool. With 6 people (or 6 elements in more general) one can simply draw a diagram. A diagram is not a bad tool. But with larger projects, the diagram will quickly become rather crowded. This is where a software tool can help you. In the video I explain one particular solution, called ProjectDSM. Before watching the video, I suggest you go back to the example first and try to solve it (it will only take you a couple of minutes). This will give you a sense of how easy or difficult this is to do (maybe you can try do to it first without any tool, and then by drawing a diagram). If you are interested in applying this approach, there are couple of readings you may want to take a look at. There’s a chapter about it in my own book. If you want to go into more details, I can recommend the book by Eppinger & Browning, which provides a number of examples of how this methodology has been applied in different industries. This is a bit off topic, but ill give it a go. In this video you are saying that strategic design is about aligning the organization to the capabilities needed to realize the strategy. Does this mean that the capabilities needed to realize the strategy are the same as the high level functional requirements of an organization? What are your thoughts about this? To be honest, what I am saying in the video is a bit of simplification. There’s no right answer as different people use different terminology (unfortunately – as it makes the field confusing). But this is the way I see it: A “capability” is a higher level concept (such as “global responsiveness”), whereas as functional requirements are lower level (meaning more specific) statements that describe desired outcomes (such as “develop products tailored to needs of customers in different regions”) and that can be mapped to organizational units and processes. So, yes, more formally I would say that strategic design is about translating the strategy into functional requirements (or functions). Operational design is about considering the interactions between the design parameters. Too bad it doenst allow data to be imported. Also a bit off topic but here’s my shot: did you ever come across à program that allowed to import data from for example linkedin from multiple accounts to create a nice map of a network/organisation? I know Visone doesn’t allow it… It would be an awesome thing to see though. But note that we are talking about two different concepts: Social network software helps you visualize social networks – DSM tools help you visualize and optimize work process interdependencies. Yes I noticed that. But my goal is to identity clusters of people all identified/linked to eachother which might be interdependent. So it is somewhat social network analysis but I want to approach it on a more organizational design/interdependent way.